Some things just do not photograph well. Let me rephrase that -- there are some things which I just cannot photograph well. Like homemade tahini. I know this looks like a pile of slop, but try not to focus on that part. Instead, direct your attention to my brand new mortar pestle (oooh, ahhh). You like? I've used store-bought tahini once in the past for making hummus. Although it was tasty and all, I had to buy a whole can of it when I needed only a few tablespoons. Sadly, much of it went to waste, which pains me because this stuff ain't cheap. So this time, I decided to make it myself and it was surprisingly simple. Yes, mashing it up in the mortar pestle requires a bit of elbow grease...but that's why we work out, no? To be better cooks, right? Of course! Step 1. Get out some sesame seeds and toast them until nice and well, toasty. Step 2. Put them, along with some olive oil, in your lovely new mortar pestle. No picture here, sorry, got a bit anxious. Step 3. Mash the bejeezus out of them. 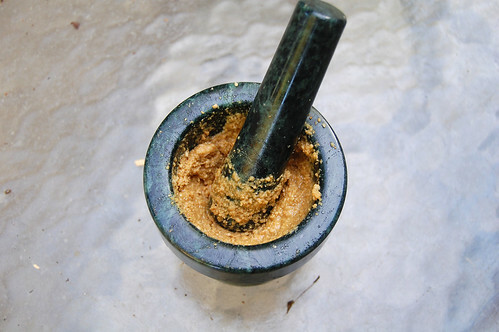 Since I used a small amount of sesame seeds (about 1/4 cup) I made this in a mortar pestle. For a larger batch, you could certainly save some time and effort and make this in a food processor. 1. Preheat oven to 350. 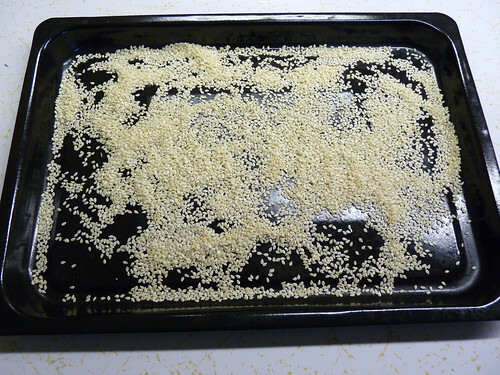 Toast sesame seeds for 5-10 minutes, tossing the seeds frequently with a spatula. Check often and make sure they do not burn!! Cool for 10 minutes. 2. 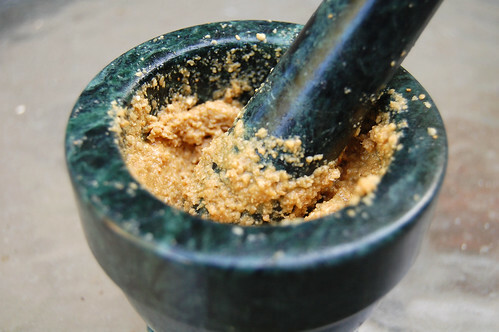 Mash the seeds and oil with a mortar pestle until mixture is somewhat smooth and thick. The mixture will still be slightly lumpy. Hey, I like your photo, Ms. Meanie. It was the first thing I noticed-it's actually kind of artistic and cool looking! This is a super useful recipe too. I needed tahini the other day and only had sesame seeds. I just gave up and didn't make the dish. Funny b/c I also have that exact mortar and pestle. Well, I mean, it looks exactly like it (smile)! Is that IT!? That sounds SO easy! I will make this asap when I return to the States! Wow. That IS easy. I think the first photo looks great. I love your new M&P (like my abbreviations?)! I love using mine whenever I can. I've never had tahini. Considering how it easy it is to make, I should make this one day. P.S. I don't think vegetarian paella sounds crazy. I know I would even eat it. Just pile a bunch of yummy, fresh, sautéed veggies over rice with garlic and other seasonings, and you're good to go! Good luck with the giveaway! P.S.S. How's your move and transition to being a "real adult" going? Thank you, thank you, thank you for this! I haven't been able to find tahini in either of my local grocery stores so I've shied away from any recipes using it. I had no idea you could make it yourself! I love tahini...love it even more homemade. It looks plenty appetizing to me! And ooh la la that mortar and pestle. I hope there will be some mojitos as well! Actually, I think the photos look great. Maybe that's because I love sesame seeds and anything that can be ground with a mortar pestle. The old school methods are usually the best. This sounds delicious! I never thought of making tahini from scratch. For some reason, I always gets tahini and tamari mixed up. It drives me insane. Wow, I didn't know tahini was so simple! And I'm a big fan of cooking that requires a little elbow grease. Love your rationale for exercising, haha. 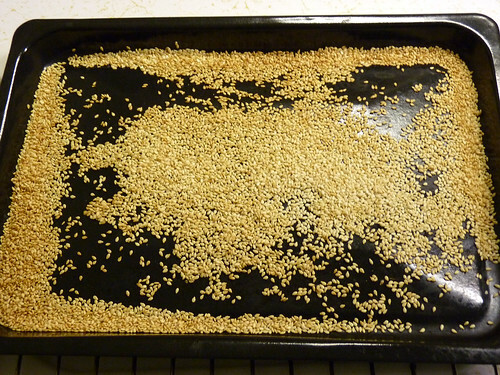 Right now I have black sesame seeds left over from making pide, but no white ones. Do people ever make black tahini? @Memoria - I agree about vegetarian paella! I think the real center of paella is the rice. I think we sometimes see rice as just a side or a filler and forget how central it is to so many dishes in so many cultures. Like, Americans say sushi and mean raw fish, but in Japanese, it refers to the rice. Thank you thank you Stella, Burp, Memória, Mags, Joanne, Valerie, Ali, and heatknives!! Memória - My transitioning is going well, thank you for asking! I am moving in August and start teaching at the end of August. I am excited and completely terrified at the same time. eek. heatknives - I am not sure about black sesame seeds, but I did look it up and there is such a thing as tahini made with black sesame seeds. I think it's definitely worth a try to make it! so it may not be the most attractive of edibles, but it's certainly one of the most versatile and delicious! ooo I love homemade tahini, so healthy too! I usually use store-bought tahini and toss it with noodles. Summer may be a good time to do just that again! And your homemade version is definitely way better. It looks good! very good! Tahini....Yumm! I LOVE hummus. I mean L-O-V-E! Tahini doesn't do to waste in my house. ;-) This looks wonderful. And your pictures are beautiful. I always love your photos. Don't be so hard on yourself, Hun. You make delicious things and capture them beautifully. Yes, I am impressed with your mortar and pestle! But even more to read how simple tahini is to make. I had no idea! Not being lucky enough to have a mortar and pestle :( , I will use my food processor! I am a graduate student who loves to cook and bake. For cooking, I like using local and seasonal ingredients. For baking, I believe chocolate chips make (almost) everything better!